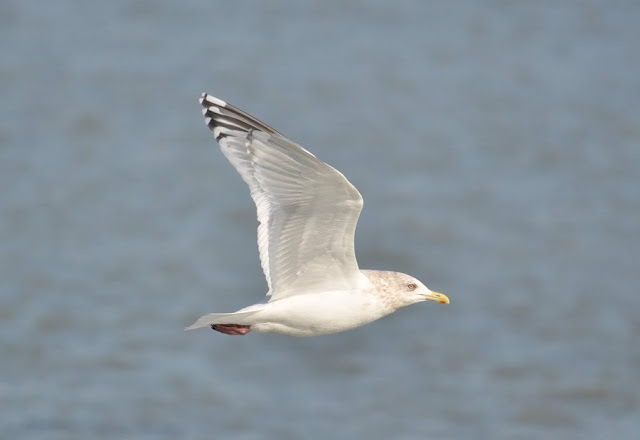 Someone recently posted several photos on "North American Gulls" of an adult type Herring (Wilmington, MA. December) with a thayeri wingtip pattern in which the under-primaries appeared relatively pale. This prompted me to look closer at my Herring albums to get a clearer understanding of what variability may exist here. The variability we're most interested in, is the shade of black/gray that can be found on the under-primaries. It's been suggested that the upper-side and under-side of the outer primaries should be the same color in Herring Gulls, if not, very similar in tone. Is this always so? Clearly when we observe the folded wing, the under-side to the far wing and the upper-side of the closer wing aren't always the same shade of black. (1) The under-side of p10 on the far wing is a shade paler than the upper-side of the right wing. (2) In addition to the relatively large p10 mirror, the most characteristic feature of the thayeri-wingtip is the limited black on the inner web of p9, in which the gray inner web and its white tongue tip merge with the mirror. Interestingly, this individual lacks the typical black subterminal band on p5 that's found in many adult American Herrings. The objective of this post is to discuss the underwing of individuals like the one pictured above. (3) Although the outer webs of p8-p9 are obscured by the inner webs of the adjacent primaries, it's clear from this image that the underside of p10 is paler than the upperside of the wingtip. (4) Thayeri-wingtip shown on the upperside of left wing. Again, note the absence of a subterminal band on p5. 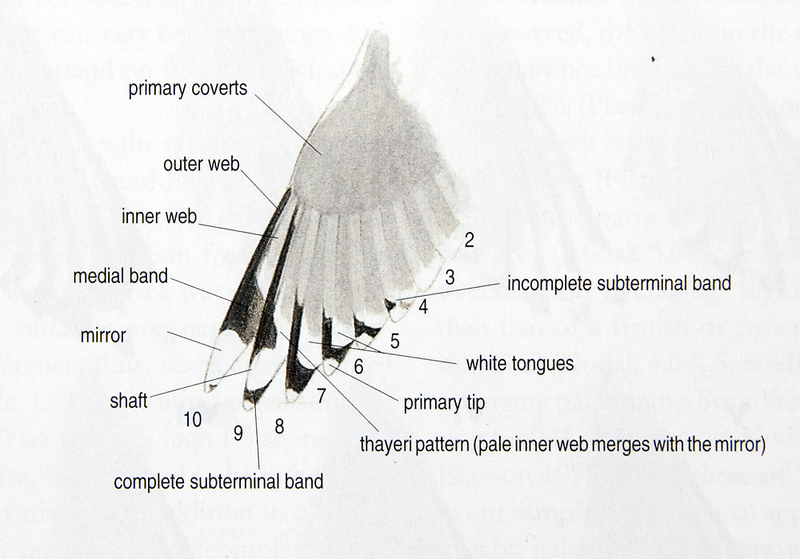 Clearly, the subterminal tips on the underside of the right wing are NOT forming a dark band such as in image (3). The underside to p10 is surprisingly pale. (5) Even when compensating for any overexposure of the image, both birds are holding their wings at a similar angle. I've questioned whether the bird on the right is even a Herring. 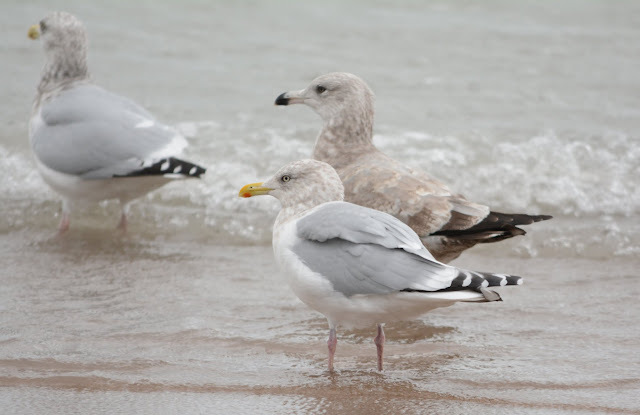 The orbital is a reddish color and the pale lemon-yellow iris and bill are pretty typical for Herring Gull. This is an extreme example that really disrupts my understanding of how pale Herring underwings could, or should, be. There is no "other" indication of this not being a Herring Gull. Size, structure, and the gray color on the upperparts all agree with that taxon. (6) Another Herring with thayeri wingtip. Note the slaty-gray color to the upper primaries. Otherwise, this bird is a typical Herring in every respect. (10) Same individual above. Note how the under-side to the primaries has a similar shade to the upperside - not as strong of a contrast as I'd expect. Clearly not all American Herring adults with thayeri wingtips show paler under-primaries. In fact I'd guess only a small minority do. A very important consideration is how much lighting (reflective properties of the under-primaries and over-exposure) is effecting what is seen in my images - something I'll have to pay extra attention to in the future. Are individuals with paler underwings (such as image #4 & 5) within range for American Herring? Do Herrings with non-thayeri wingtip patterns show pale under-primaries? Can the color to the upper-side of the primaries look like #6 & 7 in pure American Herrings? If these birds aren't Herrings, then what explanation can possibly be given for the lack of melanin in the wingtips?